I almost didn’t participate in the Secret Recipe Club again this month. It was pretty late into March when I realized I hadn’t received an assignment so I checked out the participation form and saw that my name was not on there. Clearly remembering signing up, I emailed my hostess and she managed to get me added back into the group! This month I was assigned to Della Cucina Povera, which is written by Francesca. I feel like in another life, I could be like Francesca and live in different countries, trying out all different types of foods. It was really hard for me to pick a recipe. I was first intrigued by how many recipes called for Za’atar since it is not something I can easily find here. My first thought was to make the seasoning and then find a recipe that called for it, since there were many, many options. I was also very intrigued by the dishes similar to meatballs. I even saw a pie dish that I spent some serious time contemplating. But then, I saw this wonderful bright vegetable dish and knew I had to make it. The deep red of the tomatoes contrasting against the white and green of the zucchini just screams warm weather to me. While we are not quite there yet, and this dish would probably be better in the summer when we have an absolutely abundance of tomatoes, I could not wait. This also fits in nicely with my plans to eat healthier, so I all but ran to the store to get the ingredients. 1. Drape the tomato slices around a colander and sprinkle with salt. Allow to sit for 20 minutes, or until much of the moisture has drained out. Pat dry with a paper towel. 2. Preheat the oven to 375. 3. Add 1 tbsp. of olive oil to a skillet over medium heat. Add the zucchini and sauteed until golden brown, 2-4 minutes. 4. 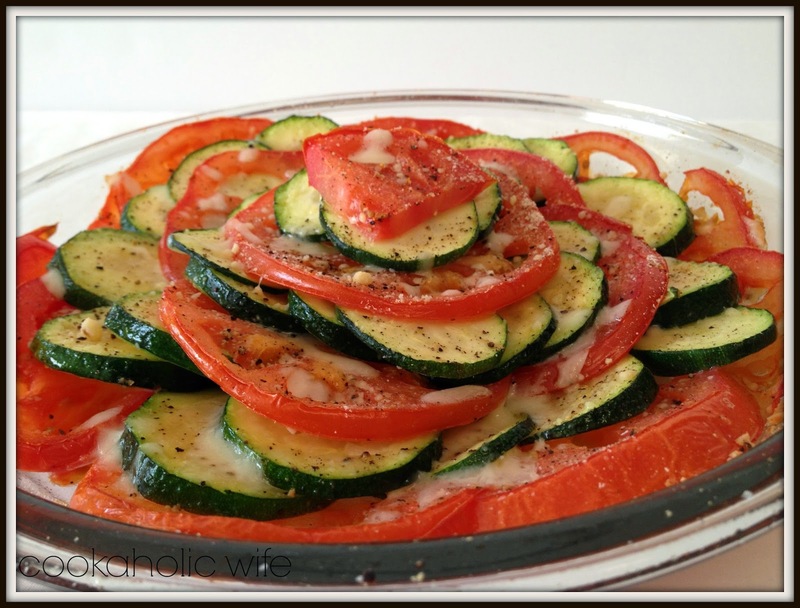 Layer the tomato and zucchini slices in a baking dish, alternating them to create a pattern. Drizzle with the remaining tablespoon of olive oil. Sprinkle garlic, Parmesan and mozzarella on top. 5. Bake for 20 minutes or until cheese is golden brown. Season to taste with salt and pepper. The only change I made to this recipe was to use Parmesan and mozzarella. I thought we had enough Parmesan in the fridge and it turned out we did not. Not wanting to run out to the store again, I opted to use some mozzarella in it’s place. 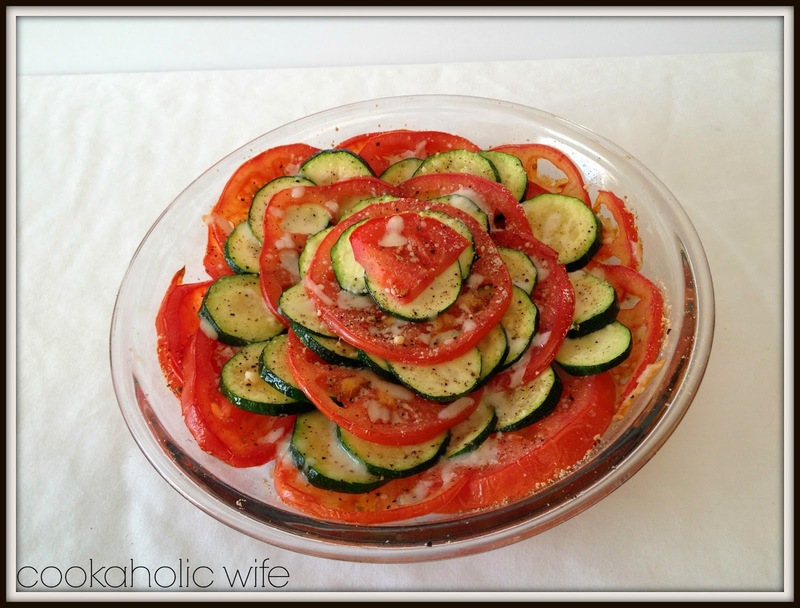 I would also suggest using Roma tomatoes or other ones similar in size to the zucchini rounds so it’s easier to layer. I was just drawn to the beefsteak tomatoes. This could easily be a meal for me. 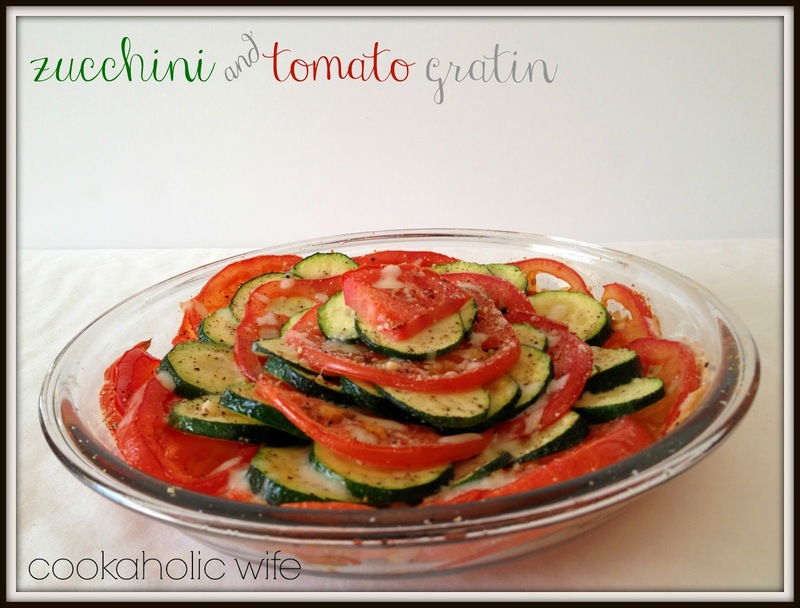 No meats or starches needed, just give me this wonderfully tasty dish of tomatoes and zucchini and I am one happy camper. Gorgeous recipe – the colors look fantastic and can only imagine that the taste matches. Great SRC pick! This looks right up my alley! I'll bet your addition of mozzarella was really good. What a delicious combination of flavours and colours – just gorgeous!